Today looked more hopeful. 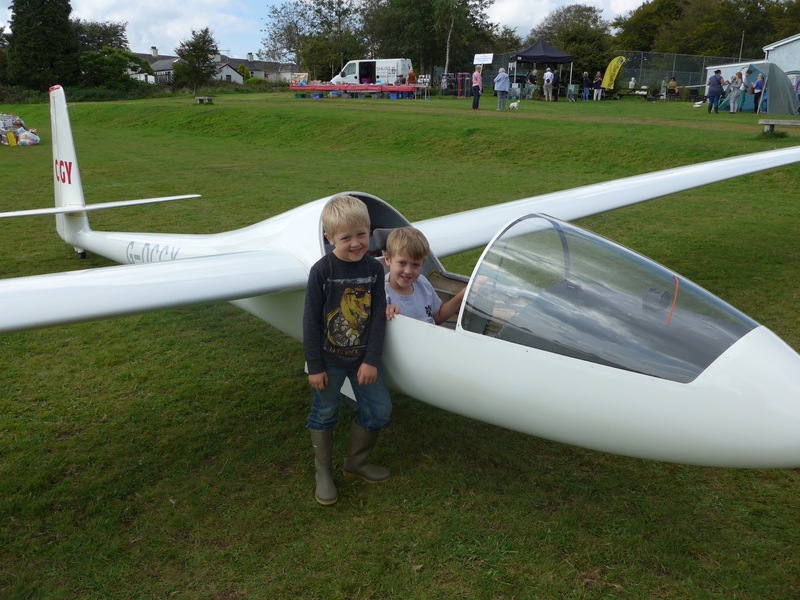 No rain in the forecast until later, cloudbase above launch height and with the couple of hours of soarable conditions enjoyed on Sunday. Maybe……..just maybe.. The K13 waiting for another launch into an unpromising sky. Try as we might there was just no soaring available, but everyone who wanted to fly, did so. Thanks once again to Heather for her retrieve driving and Barry for the winch driving. "You wouldn't believe it after yesterday!" intoned Dave Downton, gazing up at a gin clear early morning sky, "After all that rain and low cloud it just doesn't seem possible." But it was; and you had to be quick. At 1005 ready to launch there wasn't a cloud in the sky; by 1030 it was peppered with fluffy cumulus reflecting the small, upward spike on RASP that lasted for 2 hours or so before returning to zero. Looking across the moor from 2700 feet, stoneage field boundries easy to see. Pundits can often be found surveying the sky, giving their assessments of convection, wind strength and energy before deciding to 'leave it until later'... Not so at Brentor today, where those who got into the air by 1200 experienced some good soaring (flight of the day taking Richard Roberts to 3,000ft for 44 mins) whereas those who waited until afternoon found the sky almost blue, albeit some tempting cloud streets appeared (if you could reach them...as Pete Harvey did in the Zugvogel). who had travelled from Falmouth, and works on the Cornishman newspaper. 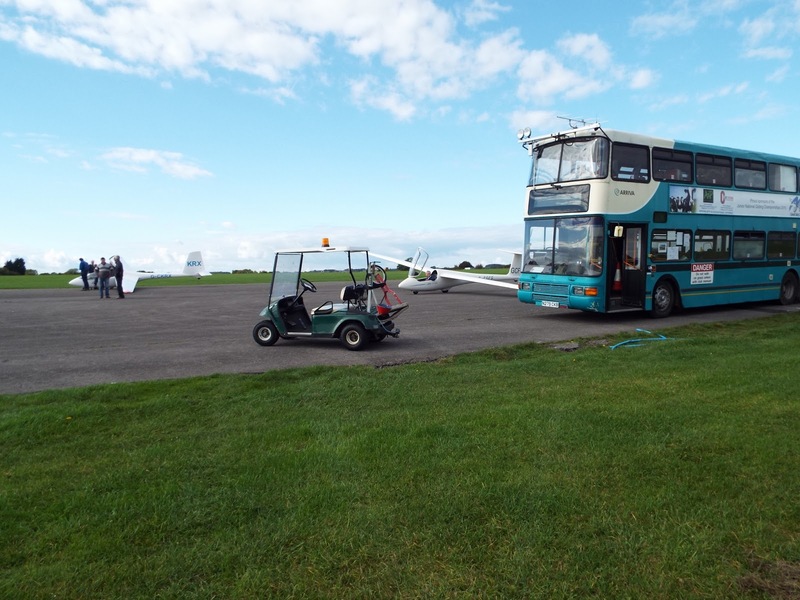 All this was of little concern to our visitors, however, who, enjoying the clarity of the views aloft together with the clarity of the views of their Introductory Flight Pilot Roger Appleboom, were greatly entertained! This group included One Day Course student Alex McLaughlin, visitors Alex White and Andy Grant, Canadian holidaymaker Roger Spall and émigré from North Hill Wynn Davies. 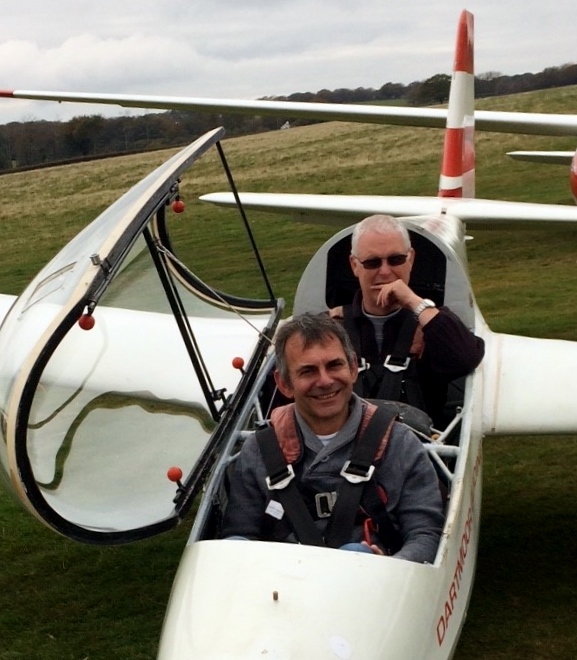 Visitor Alex White with Introductory Flight Pilot Roger Appleboom. Roger also flew with Roger Spall, who was visiting whilst on holiday from Canada. The trainee team included Elliot No Coat ('if it doesn't kill you, it'll do you good') Acton, Ed Nikonmeister Borlase, weather watcher Dave Downton and very welcome newcomer Alec Birch, who had signed up for our Fixed Price to Solo Scheme. With dusk falling an hour earlier than yesterday, safety over-ruled flying beyond five, at which time we bade farewell to Alex after her 6th and final launch (by which time she was flying the K-13 using all 3 controls together) and shut the hangar doors on completion of 41 trouble free launches. Arrived at Aston Down early evening, accommodation was very good, unpacked then had a look around... airfield was huge which was great... there was no chance that even I could miss it. Anyway a couple drinks in the clubhouse and an early night was called for. 9am start... Winds 180/25, visibility 20K, rain and drizzle . 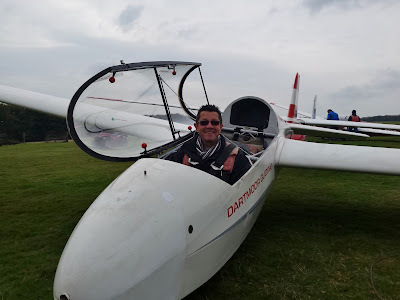 Don made the best of it by giving us a talks on Trim & Best speed to glide, principles of flight, altimetry and launch failures, all interesting stuff, lots to learn. Finally the rain stopped at 2pm so it was time for some aviation. So out it was with the PW6. Bit of a shock I was hoping it would be a K13 but had a couple flights with Don in it anyway. Felt very alien at first and took a little getting used to. Airbrakes on top only, which as Don described sounded a much better design, though took a little while to get used to it automatically pitching down when I opened the brakes. Needless to say, my performance was shocking... I was surprised Don let me carry on playing but thankfully he did. I did like the seating position, very comfortable and the trimmer was great. It was time to pack up all too soon. 8.15am start, Winds 140/15 Rain and drizzle to start. low cloud rising pm. A morning in the classroom with Don again. oh will this rain go away... well it finally did around lunchtime. Managed five flights today, lots of circuits which was good, helped me get used to the PW6 and by the end of the day I was starting to love it. 8.15am start, winds 300/25, visibility 30K, rain until midday. Briefings today around map reading and airspace... lots for me to learn. Managed six flights today. 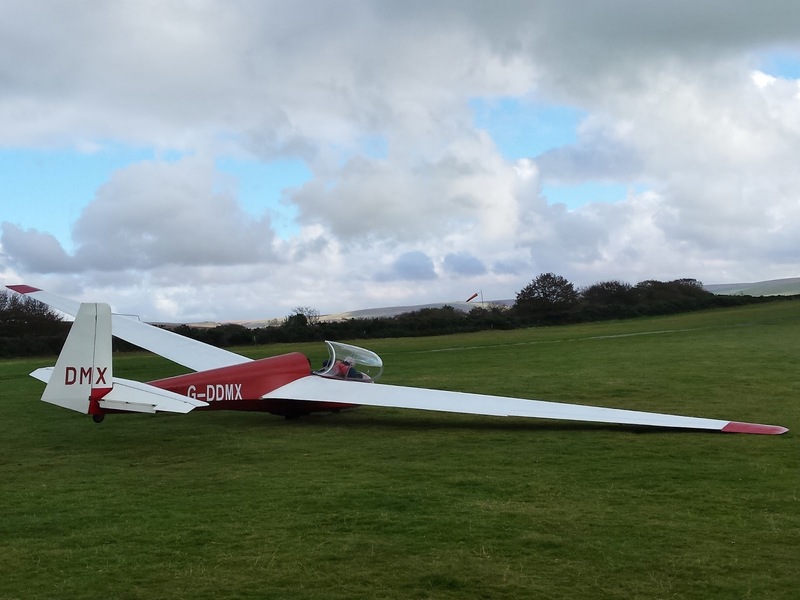 A bit of a crosswind today which made it interesting. Mixture of stalls, spins, spiral dives. What a fun day (strange as I don't like rollercoaster's but this was fun), the PW6 is great for spinning exercises, I wanted to do more but unfortunately the day was coming to an end... well there is always tomorrow. 8.15am start. 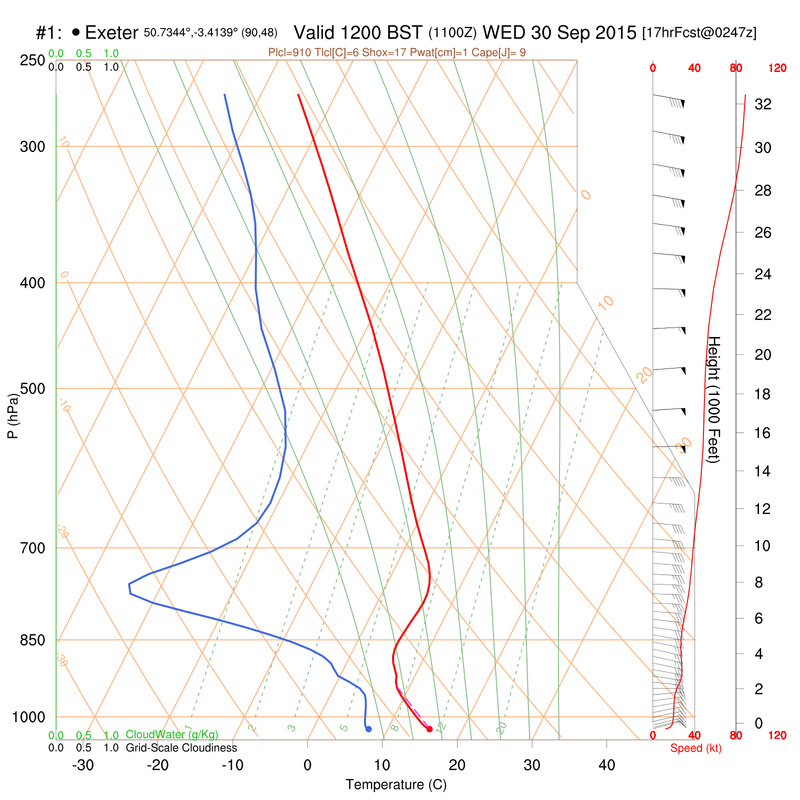 Winds 250/05, visibility 30K, cloudbases rising to 4000ft QNH. 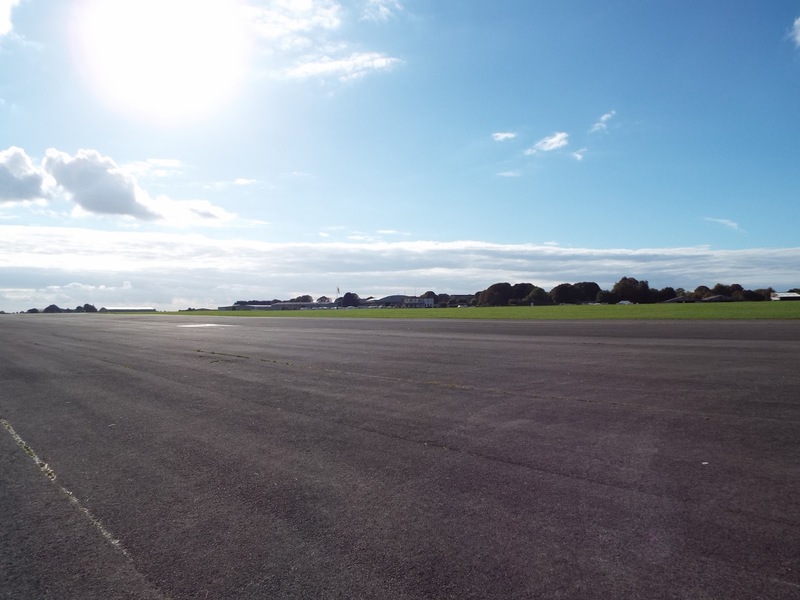 Notam class D around Kemble from 16.15 Z.
Woke up today and it wasn't raining for a change. Six flights of Launch failure.. Launch failure oh and more Launch failures. Flight 7.. wow we reached the top of the launch.. Don stayed quiet in the back and let me do my own thing, it was great to just go where I wanted. Once we landed Don asked me if I would like to do it on my own... I'd love to. Didn't have much time until the notam kicked in but off I went (Don probably guessed the chances of me staying up there longer than 5 minutes were slim to none). 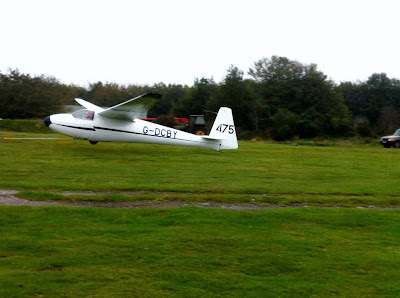 Just a quick circuit and a few minutes later I was back on the ground. What a flight I loved every second of it. Yippee my first solo flight done... longing for many more to come. We then packed up. 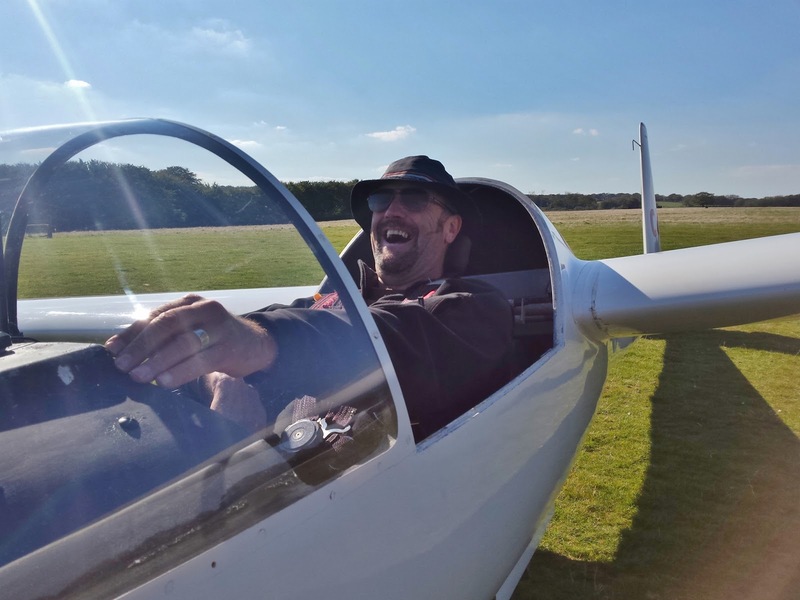 Filling in P1 in my logbook as me was novel and kept me smiling. We all went out for a course meal at a local pub in the evening which was a very nice to finish the day off. 8.15am start. light winds, foggy to start and sunshine later. I couldn't stop smiling... well up until the point I realised I needed to get back down again and couldn't see the runway. 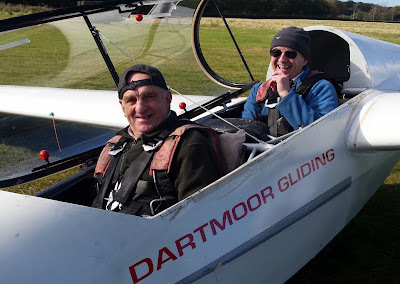 Thankfully Don was there to talk me through how to get back down through a gap in the clouds and trying to find the runway. Heart was pounding a bit to say the least especially knowing that cloudbase was so low but what an amazing experience. A little later once the cloud had truly lifted and broken up, I had four more solo flights. Mainly circuits but found a thermal once... now if only I could thermal properly.. I thought I was up there for ages... until I checked the log... 8 minutes lol oh well I can only get better I guess. What can I say it was a great week, with a great bunch of people. Unfortunately they wouldn't let me take the PW6 home, well you don't know unless you ask.. I'd like to thank Don for having the faith in me to send me solo and not giving up on me earlier in the week when I felt like a fish out of water in the PW6 initially. 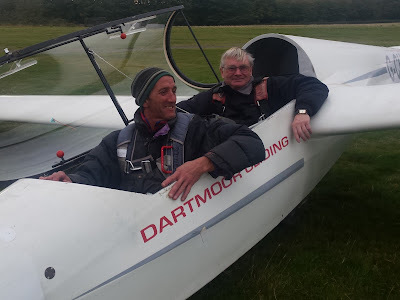 I'd also like to thank Ged for all the instruction before my week away and enduring some not so pretty landings of mine. I'd like to thank Rick for the trial flights and encouragement he has given me along the way. Actually I could be here all day so.... I'd like to thank everyone else at the club for the warm welcome and encouragement, it's been a great adventure so far to reach the first rung of the ladder.... learnt a lot... now there is so much more to learn, refine etc. it will be a life long journey that I look forward too. 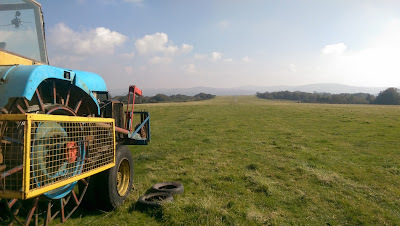 Sitting here writing this blog on Sunday afternoon, I am astounded at what a difference a day makes. Sunday looks like a great day with cloud streets from horizon to horizon. Saturday was dreadful. The promised cold front was overhead until very late in the afternoon giving low cloud, rain, strong gusty winds and it was very cold. The car said it was 10 deg C but it felt much colder than that. So a maintenance day then. My particular (self appointed) task was to keep the log burner going so that the real workers would have a warm refuge when they needed it. Rick, David and Simon worked on the vehicles. By the end of the day the Green Landrover was ready for use once more, and the ML winch had had all it’s wheels and tyres changed. 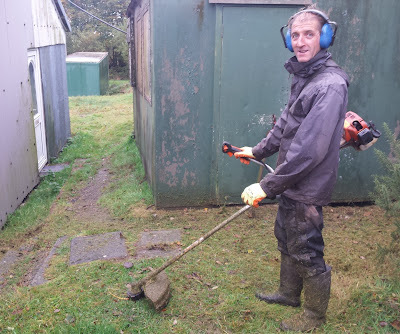 Demonstrating the real meaning of a busman’s holiday, Mike Bennett ( a professional gardener) cut all the grass around the clubhouse and trailer park. A gardeners holiday. Mike in grass cutting mode. A useful day thanks to all the volunteers. I will await Sunday’s report with interest, and maybe a little jealousy. According to Alexander Pope “Hope springs eternal in the human breast;” . This is definitely true of glider pilots. 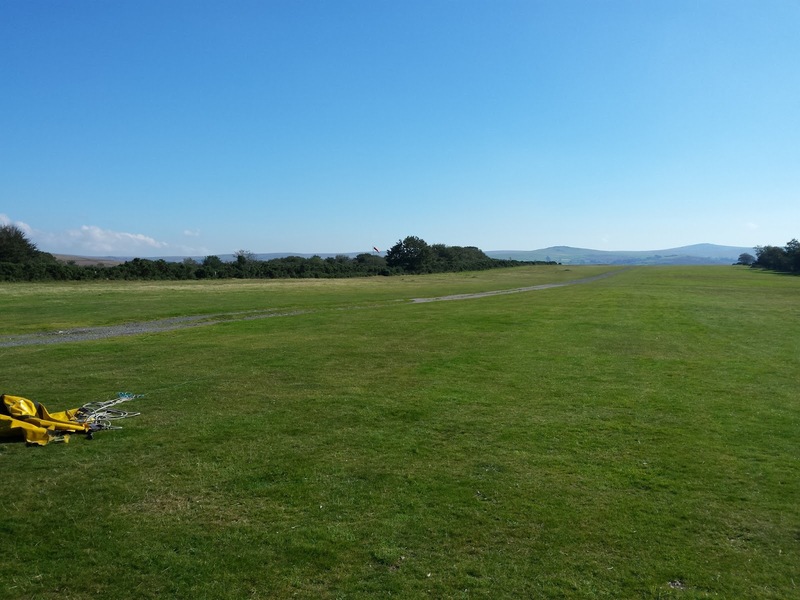 The weather forecast for today had been quite clear for a couple of days but still I hoped that it might be wrong and that we would find a flyable window. 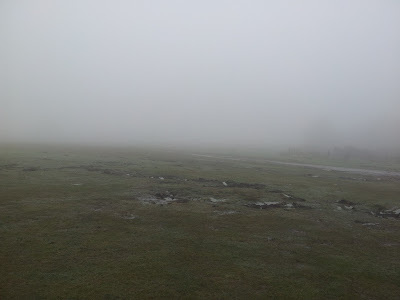 A warm front passed through the area today with the inevitable results of fog, mist, drizzle brightening to very low cloud. We waited patiently for the conditions to improve by the cloud base never got above the tree tops. We mostly spent the day in the clubhouse putting the world to rights with occasional discussions of an aviation nature. 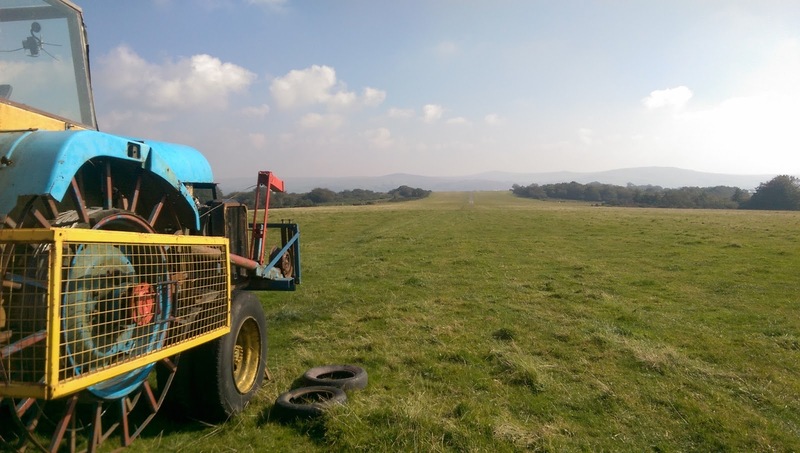 Jorg spent part of his day mowing the airfield which will no doubt be the last cut of the year. Colin worked on the K8 in the hangar. Hoping for better weather next time. Strange light and low cloudbase at the start of the day. 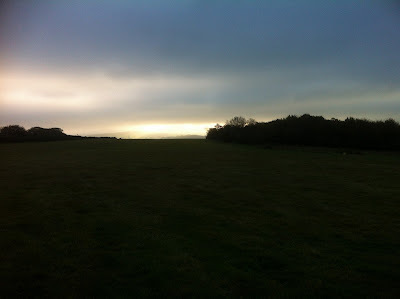 The day began with the now familiar low cloud, plus a strange lighting effect between us and the moor giving the hint of a gap between the cap cloud and the oddly arranged (and constantly changing) cloud to the east of site and overhead (see photo). 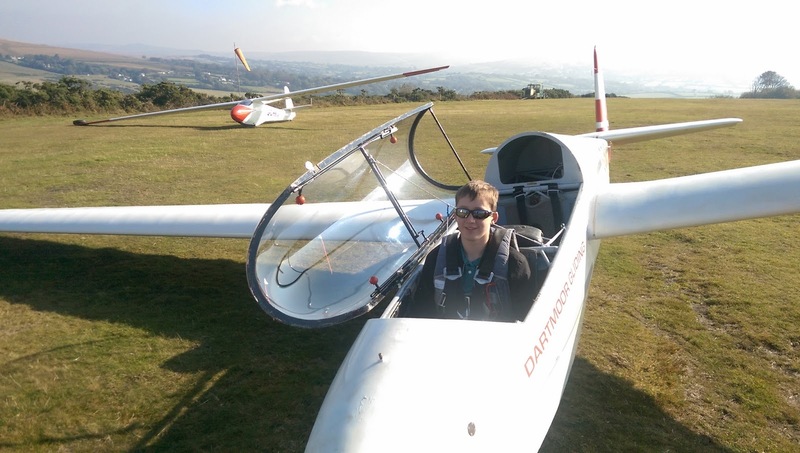 The cloudbase lifted fairly rapidly, however, and we were able to get underway by 1030, which was good news for our One Day Course student, Dan Goodman (see photo), plus our Introductory Flight visitors and a healthy flying list of trainees. an IT Consultant from Bude in Cornwall. The good news came fairly early on in the day, whilst most law abiding and traditional citizens were enjoying Sunday lunch, early solo pilot Chris Owens was noticed to be not coming down in the Zugvögel. Clearly demonstrating her keen eye this was noted by (even earlier solo pilot) Paula Howarth who, launching 15 minutes after Chris, joined him in what can only be described as a large, inverted saucer of lift extending between low key and high key areas to the south of the site. Clearly this was not convection but the leaden sheet of cloud above gave no indication of wave. There the two of them remained, Paula in the K-13 making east-west beats whilst Chris favoured large diameter circles (in 1½-2 up) for, in Paula’s case, 35 minutes and Chris one minute over the hour. Both therefore achieved legs for their next qualification and both had difficulty in extricating themselves from the cockpit due to the smiles on their faces! Thereafter the shape shifting sky gave little more, and the day slipped into an 6-7 launch an hour routine, with Sian Coombs, Nicholas Bendall, and Valerie Hart being given extended duration flights by IFP Peter Howarth (see photos), whilst trainees Dave Downton, Ed Borlase, Karon Matten and very welcome new joiner (and Silver C holder) Josef Nobbs were able to practice their landings into a light to moderate, steady, easterly breeze. 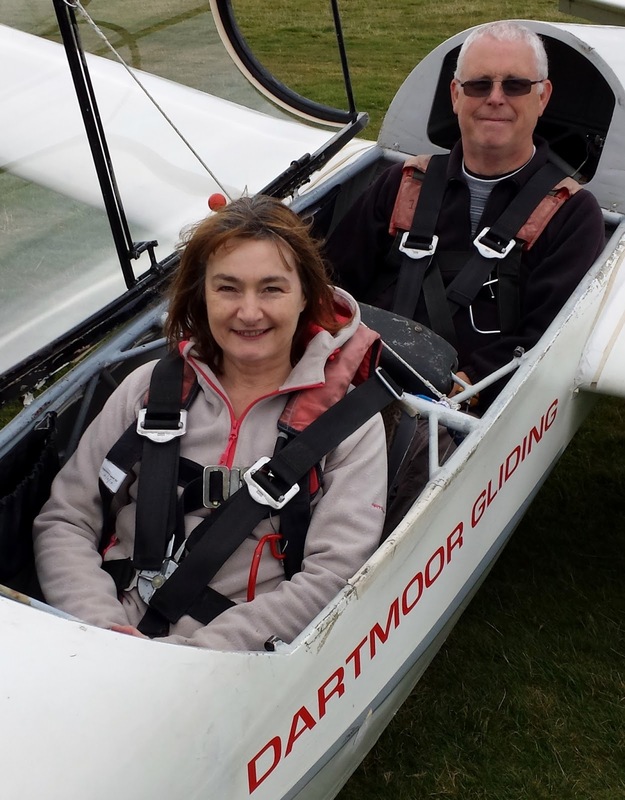 Introductory Flight Visitor Valerie Hart flew with Peter Howarth. 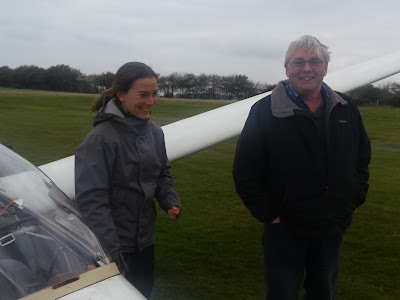 Introductory Flight Pilot Pete Howarth with visitor Sian Coombs. Introductory Flight Visitor Nicholas Bendall. Many assaults were made on Chris Owen’s ‘stake in the sky’, , but all fell woefully short, the closest (well, least far away) being a mere 11 minutes scored by his syndicate partner Pete “Grrr!” Harvey. 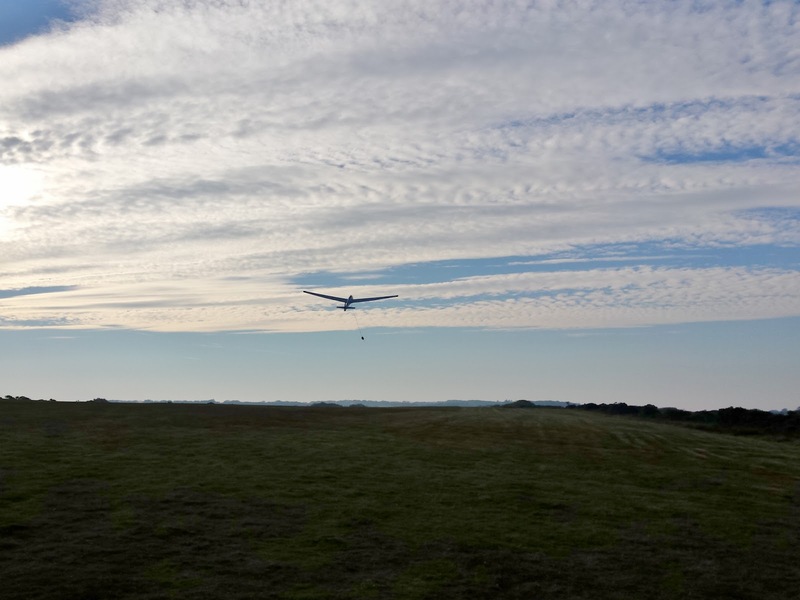 And so, as the temperature began to drop in the last hour of sunlight (note for future use: micropore cloths to the ready) we returned the gliders to the hangar, happy to have completed 35 launches without hitch. 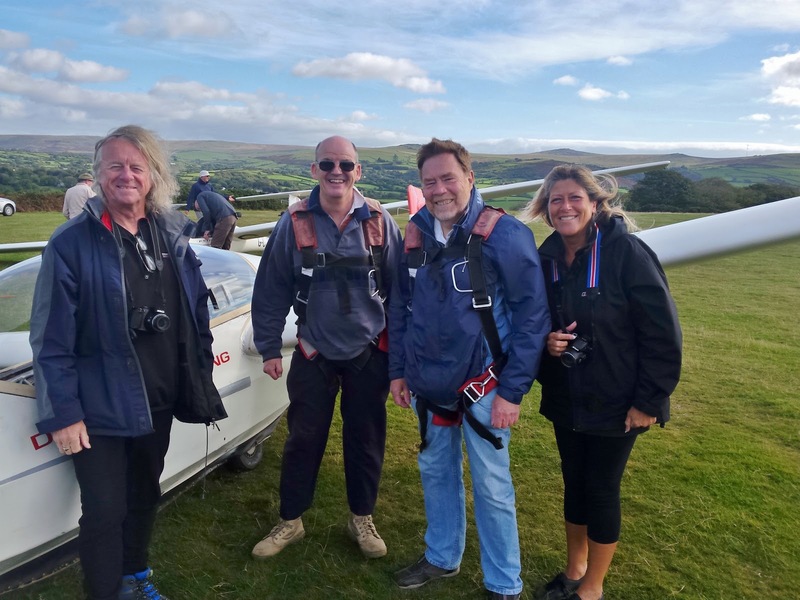 Thanks go to Barry and Heather for winch and retrieve (with Allan Holland providing Barry a welcome break), to Chris and Karon Matten (for old jokes and new Child Protection leaflets) and to Adrian Irwin for assisting around the launch point. A grey day with a light NNE breeze. With a low(ish) cloud base and no sunshine you could be forgiven thinking that it would not be worth opening the hangar. But not a bit of it. Don and Stefi share a joke. It was great to have CFI on duty today while Ged is off enjoying a rest in sunnier climes. Trainee Mike Bennett was quick to take advantage of this and flew kept Don bust. By the end of the day, he had flown his first unprompted circuit. This is quite a milestone in any pilot’s training. 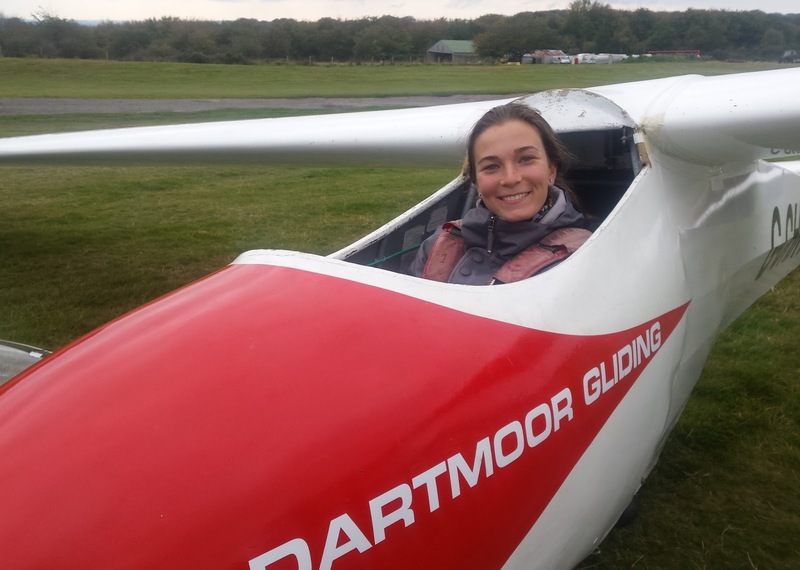 Stefi took advantage of the reasonably benign conditions to convert to the Zugvogel and flew a couple of nice looking circuits in it. I think we have another Zugvogel fan. Several other members took advantage of the day to brush up on their rear seat flying skills in the K13. Meanwhile in the hangar, Rick and David were working on the green Discovery which finished the day with a new door and suspension bushes. As the kit was put away, the evening shift, in the guise of the Committee, assembled for a meeting. The Jet Stream is nicely in place at the moment. The flow of low pressure systems is being directed away from the UK leaving us in a Polar Continental airflow giving very nice blue sky conditions albeit rather cold. This morning there was a beautiful blue sky from horizon to horizon. Gradually the thermal activity produced some CU which rapidly organised themselves into streets in the brisk NNE breeze. As the day progressed the conditions overdeveloped a couple of times temporarily cutting off the thermals. 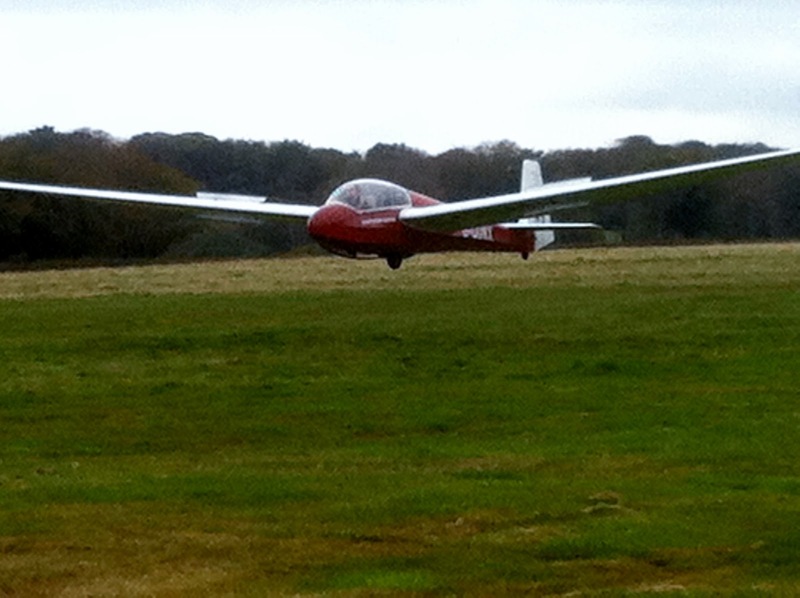 Encouraged by the conditions a couple of private aircraft joined the club fleet in an enjoyable soaring day. Best flight was by Richard Roberts in his K6 with 1 hour and 14 minutes. 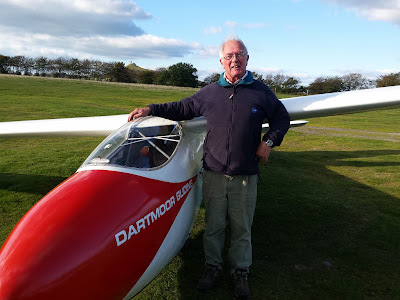 An interesting flight later in the day was made by David Rippon in the Zugvogel who managed to get to 3800 feet a clear 100 feet higher than the earlier any of the earlier flights. 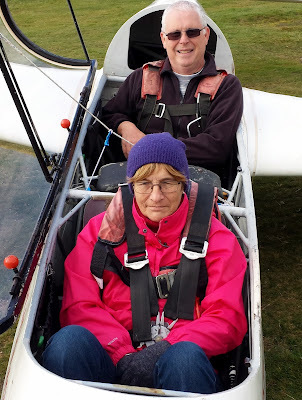 Our visitors today were John Redaway and husband and wife team Alex and Rosemary Starr who all flew with Fred Marks in K13 G-CHXP. Our thanks once again go to Barry for his winch driving and to Heather who drove retrieve for the whole day. Tenacity is a quality you wouldn’t instantly identify as being necessary for a glider pilot, since all it’s about is silently wafting about the sky observing stunning views in company with the occasional passing buzzard or other aviator. But when the pack contains strong sunshine, a steady easterly wind at 10 kts and an upward blip on RASP from 11:30 and the cards you get dealt are a full house (grey cloud on cloud (grey)) you need tenacity (aka bloody minded stubbornness) to stick it out until eventually those cards change suit. 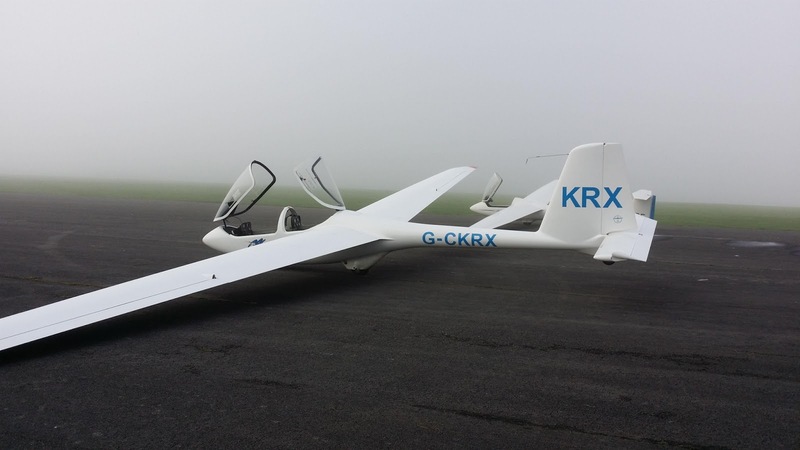 Standard Cirrus G-CGEP is Pete Harvey and Chris Owen’s addition to the privateer fleet. 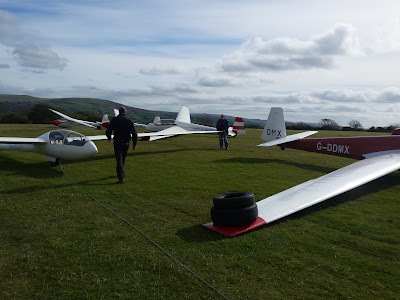 And so it was (again) for the “Dartmoor Rigging Society” (as Richard Roberts put it) as we had 7 gliders rigged and ready to go by 10:00 but no possibility of launching safely until the cloudbase had lifted. 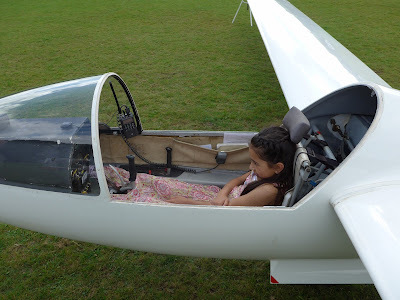 Another attribute you wouldn’t instantly associate with glider pilots and their love of silent flight (unless you’ve tuned into one of the gliding VHF frequencies) is their ability to talk – endlessly - about aviation. And so we did. Sending Roger Appleboom off in his K-6 for a snifter only added fuel to the ‘when’s it going to clear’ sweepstake, whilst the arrival of Pete Harvey and Chris Owen’s Standard Cirrus G-CGEP from Lasham (see photo) provided a welcome diversion from staring at the grey stuff. If only the sun could break through, then all would be well (i.e.. let’s just add a large dollop of unfounded optimism to the tenacity cocktail…). Pete Howarth demonstrates the non-drip method of carrying out monthly maintenance with oil. Lunch came early, included Oreo cookies (thanks, Paula), and went. Indeed some tummy clocks were beginning to crave afternoon tea before we were finally able to commit aviation (safely). Leith Whittington's Dart 17R heads the line up. Between 2:45pm and 5:45pm we managed 17 launches (so almost 6 per hour), all to 1,110ft plus, with our trainees obtaining two flights each and Flight of the Day going to Chris Owen at 10 mins in the Zugvögel, using lift that appeared to be wave based up and down the length of the airfield. Sadly our One Day Course student, Norman Hartnell, from Dunsford near Exeter, and a queue of trial lesson visitors had to rebook, but then with Dave Downton on hand at least they had an instant service! Thanks, as ever, go to Barry Green and Heather Horsewill for, in reverse order, providing the cables and launching, and also to the rest of the team (especially new member Nick Bilton and (relatively new member) Steve Fletcher) for sticking it out until conditions improved. Strong easterly winds raised hopes once again. Things were made a little complicated early on as we waited patiently for the cloudbase to be useable. There was a very noticeable wind gradient on approach. Winds at flying heights were really quite strong leading everyone to hope for wave. Everyone tried to find the wave, but while there were signs everywhere the was really nothing very usable with the longest flight scraping 12 minutes. There were areas of rotor, small areas of smooth zero and areas of strong sink. We welcomed the return of Stefi from her summer at home in Romania. She had a successful check ride with Ged and is now waiting for a suitable day to convert to the Zugvogel given the the K8 is currently undergoing annual maintenance. Our visitors today were Adam Baily who completed a One Day Course and Air Experience visitors Schaffer Mann, Tobias Uren and Michael Seymour. 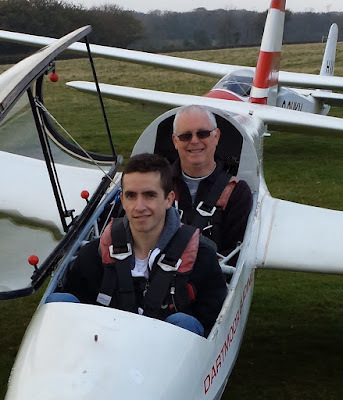 Junior Tobias Uren also flew with Mike. 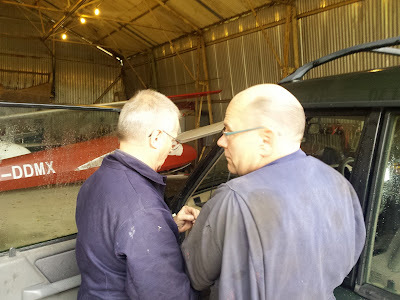 Meanwhile in the hangar, Rick and David spent the day working through some maintenance issues with the ML winch including an unplanned wheel change as one of the original tyres gave up rather noisily. Also in the hangar was Colin working on the K8, completing the glue inspections and fin removal required in this years AD. Thanks everyone for a productive day. Low pressure is with us and has presented a westerly airflow today; not the gentle zephyrs of last week but a strong 15 knot flow with 20+ knot gusts. There was not much risk of showers and there were some great looking cloud streets to explore. Tempted by the good looking sky and the K13’s soaring during their first flights, the club fleet was joined by the Open Cirrus, an Astir and Bob's immaculate K8. 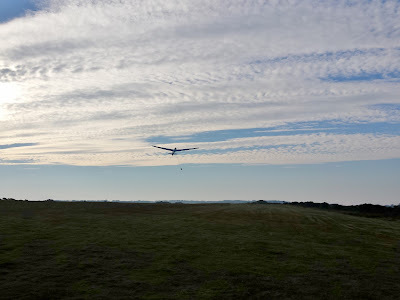 There were lots of short soaring flights as the challenges of getting upwind to the next thermals were faced. 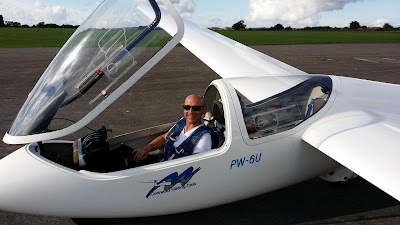 Honours for the best flight of the day was shared between Mike Gadd in the Open Cirrus and trainee Mike Bennett with Ged in K13 with flights of 29 minutes. Given the relative performances of these aircraft I think I know where the moral victory lies. IFP Fred Marks was kept busy flying a group of three friends who had all booked trial flights. They bravely elected Christine Bromley to fly first followed by Phil Mooney and Peter Austin. 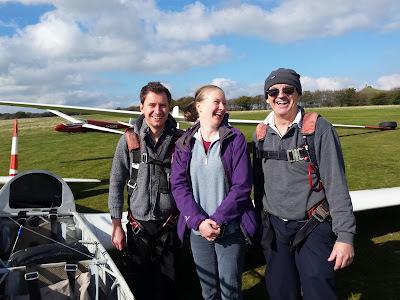 All 3 enjoyed their soaring flights. By 5:30 we had had enough of the cold winds and returned to the hangar after achieving 27 trouble free launches. To show willing, we sent the K-13 with 15 year old trainee Amelia Johnson as P2 for a snifter. Entering cloud at 450ft gave just enough height for an abbreviated circuit and Amelia just enough time in cloud to realise its effects. And so we waited. 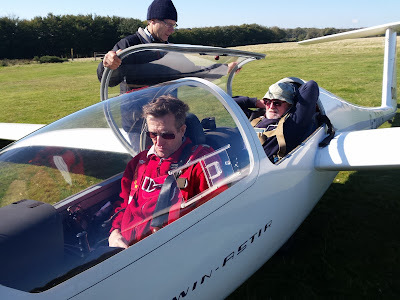 Whilst asking a question of glider pilots is a bit like seeking an opinion from lawyers: ask 3 and you get 4 different replies, today there was a general consensus that a clearance from the SE was imminent. So as lunchtime approached and with a perceptible rise in the cloudbase we had another go – managing to get both K-13s and the Zugvögel away. But by now the wind had veered due South (90º crosswind) and its gusts increased in ‘dynamic range’ (i.e.. 5-20kts) and with a gale warning issued with effect from 1pm, it was decided that we were not able to fly safely any longer. Fortunately, Dave Downton was on hand to rebook those visitors who had arrived eager to experience soaring flight – so at least they weren’t too disappointed, and we were able to fly Karen Jasper, partner of club member Chris Owen (see photo). 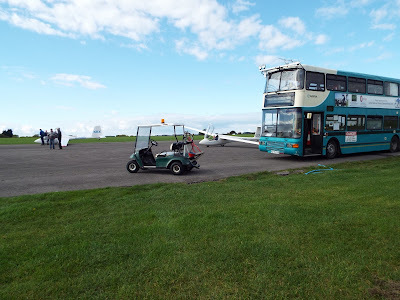 So the afternoon was spent swapping stories and doing odd jobs on the To Do List (such as painting the windsock poles green, so you won’t be able to find them! ), whilst Colin Boyd cracked on with essential work on the club’s K-8, which is in for its CofA. Oh, and we made pretty short shrift of Roger Appleboom’s home-made stollern bread - as the owner of a garage and motorcycle training school I don’t know where he finds the time…but it was delicious! 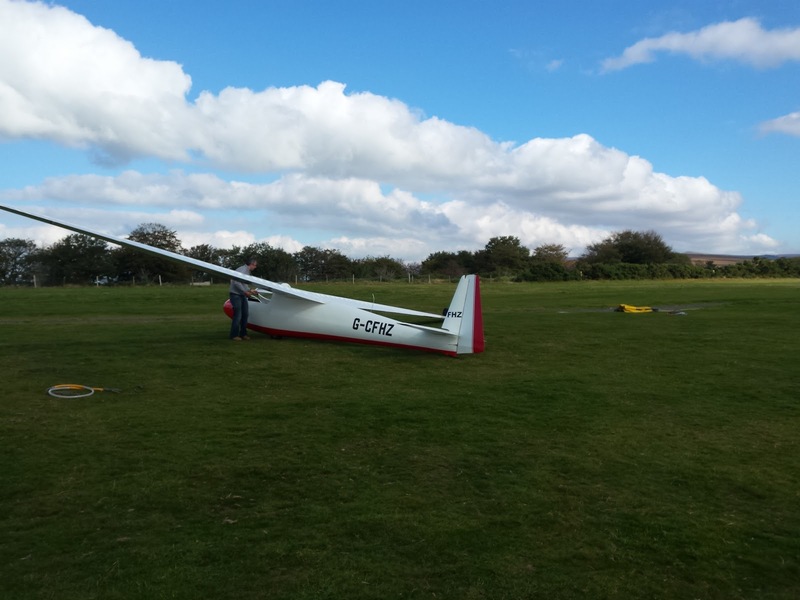 after the crosswind stopped play. This could be the last of the High Pressure days for a while with an approaching frontal system promising heavy rain etc. Blue sky and very light westerly winds were the order of the day. 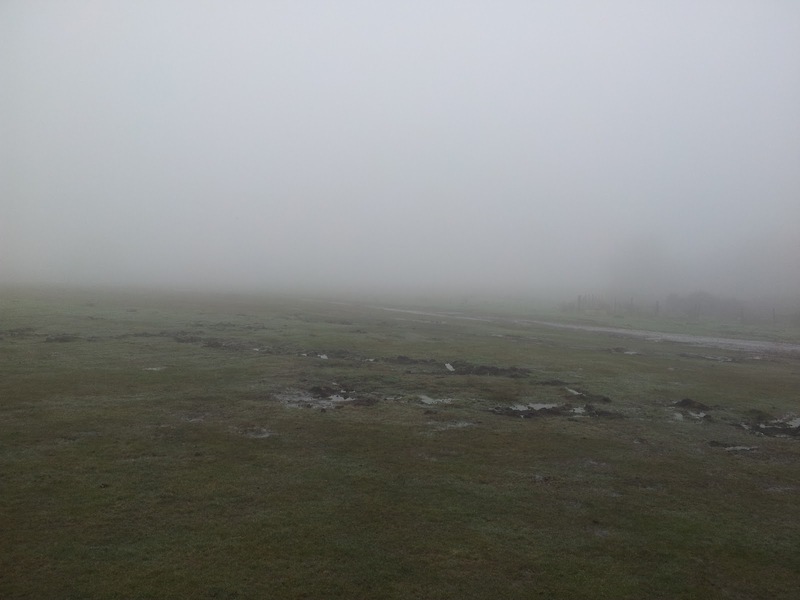 Visibility was really poor with a haziness limiting the view to to between 3 and 5 miles. We were not expecting great things on the soaring front but there were some strange looking clouds, with even more dark clag underneath, moving towards us from the NNE. These looked like very small convergences and when they arrived the behaved something like that proving thermals to 2500 feet or so. 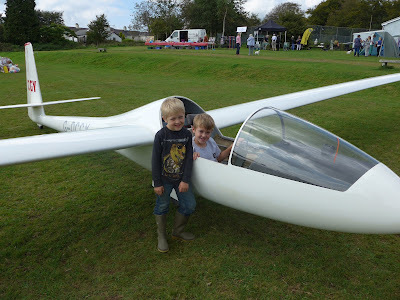 The eventual height was limited by the visibility not the cloudbase. Today's solo pilots made good use of the lift with the best flight of the day being by Alan Holland in the Zugvogel who soaring for 1 hour and 6 minutes. The solo pilots didn’t have it all their own way and both K13’s soared regularly throughout the day. 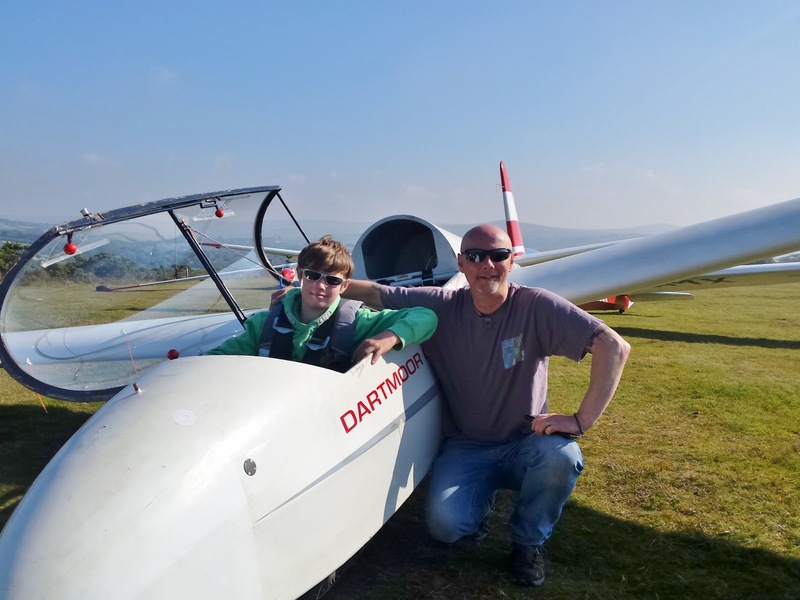 We welcomed father and son duo Gary and Matthew Evans for One Day Courses and Joshua Ainsworth for an Introductory Flight. All left with smiles on their faces. Ged was busy in the other K13 with club training. Our thanks, as usual, to all those who help and a special mention this week to Rick Wiles and those who submitted themselves to him for winch driver training. The high pressure continues, held in place by the Jet Stream which seems to control the weather in this part of the world. Today there was a beautiful, blue sky from horizon to horizon. From indoors this looked idyllic but appearances can be deceptive. The wind was very strong and gusty from the NE turning the day into a howling, snarling, beast waiting for unwary. 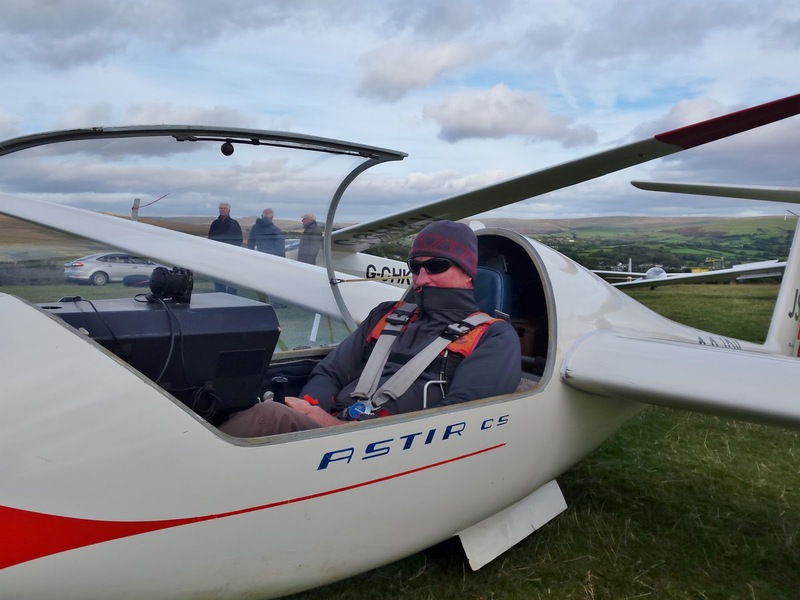 The decision was made to persuade Ged to use his Twin Astir ( a good aircraft for rough conditions ) to test the conditions while we bravely waited in the ground to see what happened. and Phil trying to stop the canopy from being blown off. It was definitely rough with a very challenging approach, but there was no signs of the hoped for wave and very little usable lift at all. Ged and his syndicate partners made several flights before giving up ( this reflects the eternal optimism of a glider pilot ). 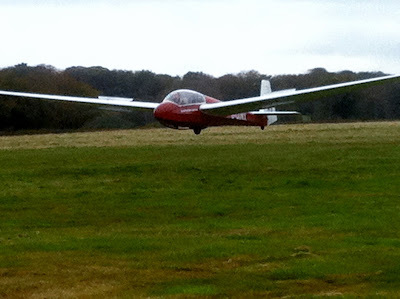 The only other flight was by Mike Gadd in the Open Cirrus who decided that enough was enough after his single flight. And where was the wave? The conditions were never right. 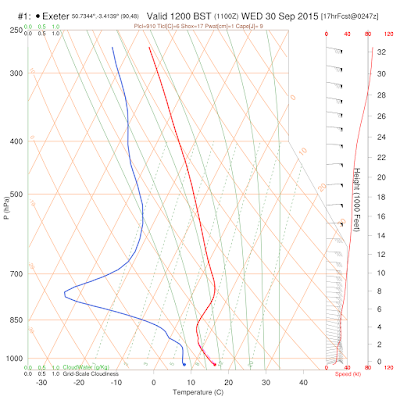 There was increasing wind speed with height ( good ) but the airmass was far too stable with little or no signs of the needed inversion and alternating stable and unstable layer see the chart below. The atmospheric sounding for midday. On Saturday 19th September, if you didn't know it already, Dartmoor Gliding joined the 'Mary Tavy Community Matters' event in the recreation field in Mary Tavy. 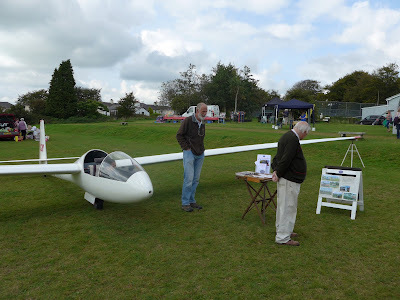 I showed my syndicate Open Cirrus at the event and had plenty of interest all day from 10-4 - at times I even had a queue of people wanting to talk to me about gliding. Many of the visitors were used to seeing us in the sky's and wanted to get closer to seeing what we look like - including the gliders... I even sold one voucher to a very enthusiastic junior Aflie Petherbridge, care of his grandfather. When he books in for his trial flight, I will try and be there to see him off. 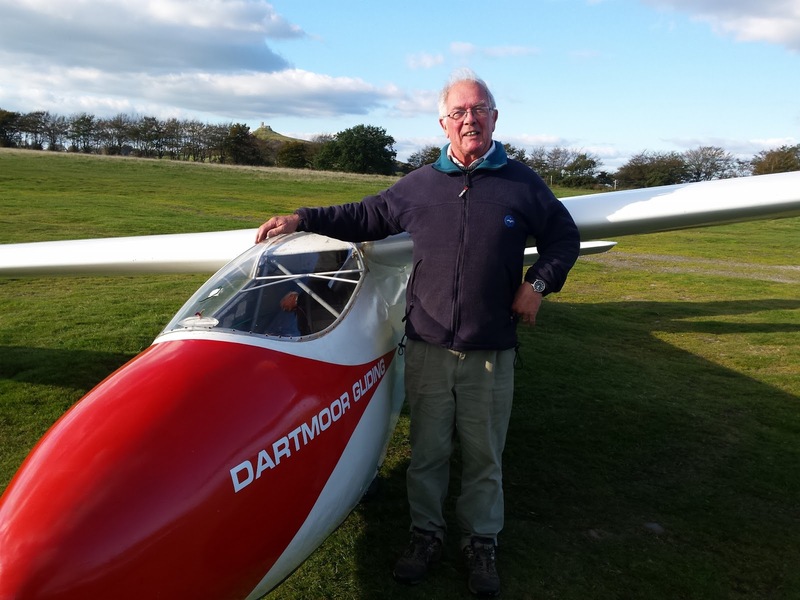 "If only I was a little bigger"
Many others, including Richard, who is a retired Vulcan bomber navigator living in Mary Tavy said they would definitely be seeing us at the club some time soon. Since we only have about 2000 in the village I'm surprised I didn't know of him already. 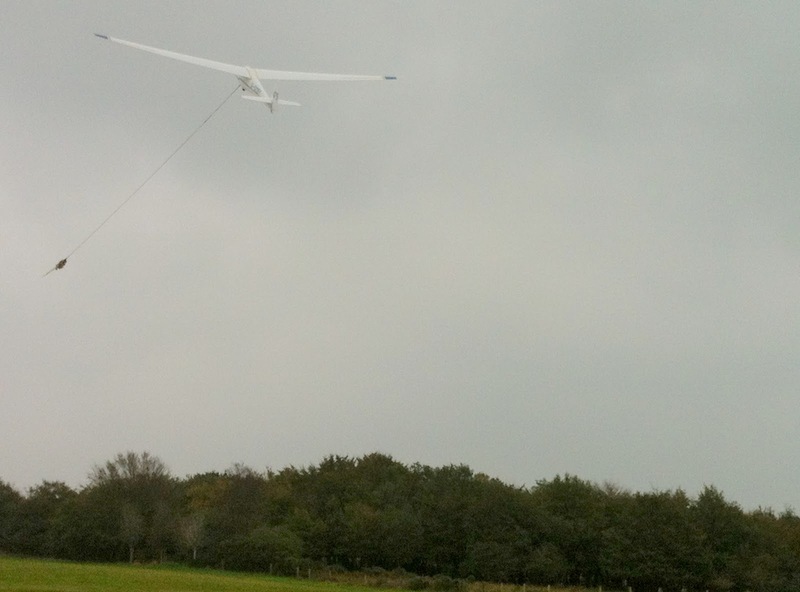 A great day, and thanks to Simon Collier for helping to rig and then after flying, returned again to help me de-rig.